These days, with the proliferation of online games and the raising of the threshold with regard to better graphics and video, it is necessary to have a high specification machine to handle it. Standard PC specifications simply will not suffice if you wish to have a splendid gaming experience. When it comes to PC games, the games define the spec of the PC they can be played on, not the other way round. Most standard specs will cater for the majority of games, but some games like “World of Warcraft”, and “Warhammer” for instance may lag if the graphics card installed on your machine cannot handle the sophisticated graphics. So what is the Quintessential gaming machine? Well, it must have good graphics, excellent audio and ultra-fast processing speed. It will also need a fair amount of disk space as some of today’s games can take up to 4 gig in disk space or more. 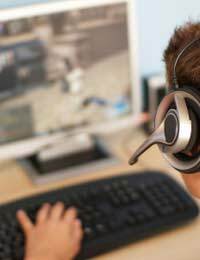 The computer specification defines your gaming experience, together with a good monitor and of course a fast internet connection in order to play online. It is not uncommon to find whole groups of people playing on the internet at any one time. Games computers are more expensive than any standard PC, due to the high spec graphics and motherboards required. Many companies will build a machine according to your exact specification, but most are pre-built. Here, we describe some of the things to look for when considering the purchase of a gaming machine. The CPU is the heart and sole of a computer and its job is to process all the instructions in a computer system. For quite a few years it was not possible to have more than a single cpu in a computer at any time. In fact, the early take up of multi processors was in industry. It is has now become necessary to consider multi-processors for gaming. Dual core cpu machines will suffice for most games, but in order to perform efficiently and provide the best experience, and allow for future growth there are an increasing number of “quad core” machines on the market. A core is basically an independent cpu placed alongside another cpu (or another core) on a single chip, or integrated circuit. Together, the individual cores provide increased processing power as you would expect. A dual core processor means that there are two cpu’s working in parallel, but a quad core means there are four. The chip the cores reside on is called a die, and the die is called a monolithic processor when all the cores reside on a single die. In most cases a dual core machine will suffice, and is to be advised if your budget is limited. It isn't just about the number of cores in a die, it is also about the speed of these processes in gigahertz. For example a dual core processor running at 2.5 GHz may run just as fast than a quad core processor running at 1.5 GHz. Obviously the higher the number of cores and the higher the speed in gigahertz will affect the final price you will pay for the processor. Multiple processor's are not cheap to buy, but are a vital component of a good games machine. It is recommended that are good games machine will have a least 2 GB of memory. These days and 4 GB of memory is not uncommon. Again, the more memory you will buy the more expensive will be your outlay. Another factor to consider around memory is the maximum memory the motherboard will support. It is recommended that are hard disk space of a least 250 gig is required. This will allow enough room to add new games and for a reasonable space for the operating system to operate at its most efficient. Graphic cards are an important component of a good games machine. Most computers have their own inbuilt graphics card. However, for a games machine the graphics card is vital part of the gaming experience and therefore care should be taken over which graphics card will provide the most excellent experience. When considering a graphics card you need to look at how much on board memory it has got and the speed it will run at. For instance a good spec graphics card will have at least 512 MB of memory and will run at a speed of about 1800 MHz. It may also be good to run your games on a television screen, therefore you may want to consider graphics cards that have S-Video (HDTV) and DVI outputs for dual monitor support, if you wish to run your games on more than a single monitor.